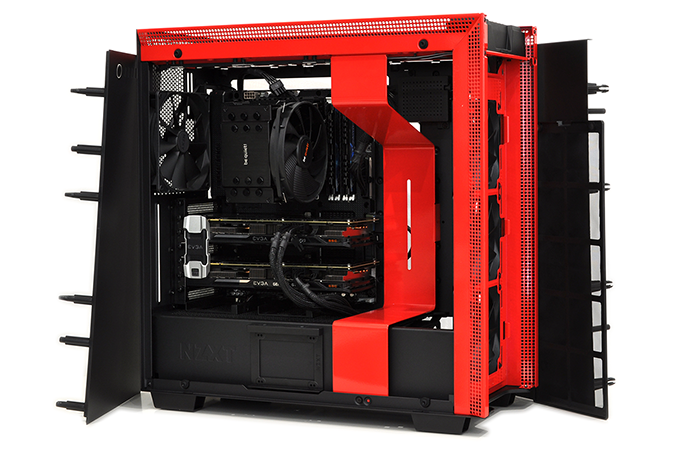 If we had to pick a favourite chassis from the last few years, there's a good chance NZXT's H440 would get the nod. One of the first high-profile enclosures to eject the optical drive, the H440 ticked most of the right boxes for a new build in 2014 and didn't break the bank at £90. Said case has since undergone numerous makeovers, with limited edition skins, additional colour schemes and a New Edition launched early in 2016, yet a true successor has been a long time coming. 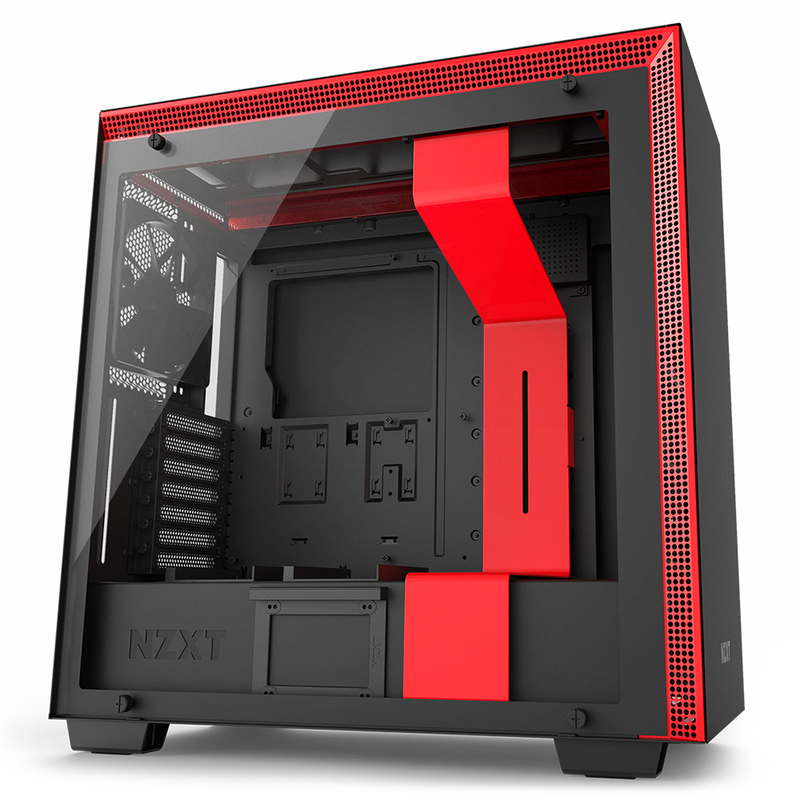 That wait is now over as NZXT is revamping its product range with a trio of cases launched under the H-Series umbrella. 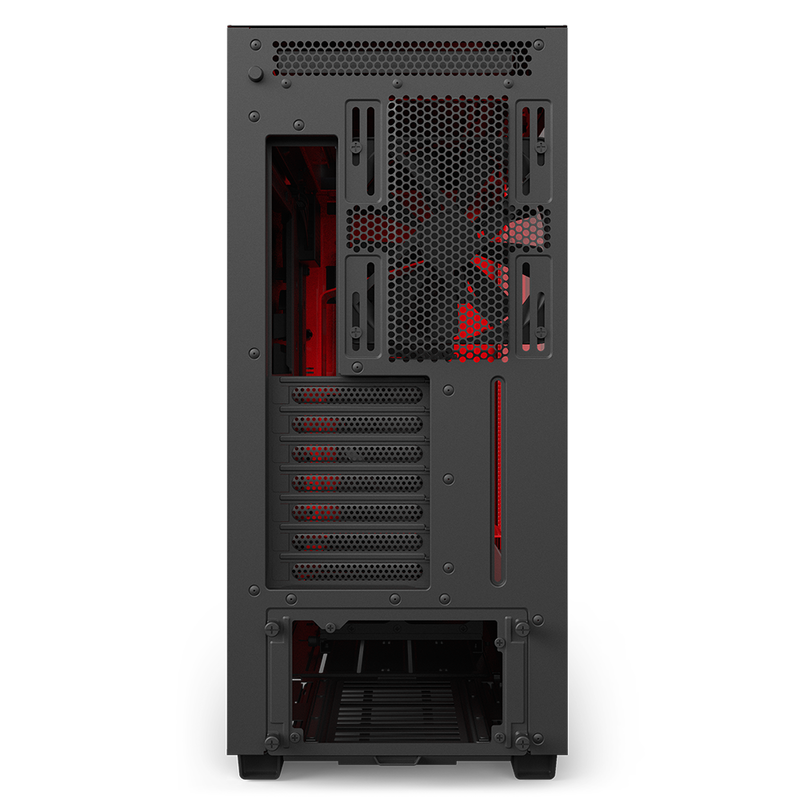 The H700i, H400i, and H200i are said to showcase the manufacturer's vision for modern PC building, and the H700i, first to roll off the production line carrying a £200 price tag, is in for review today. 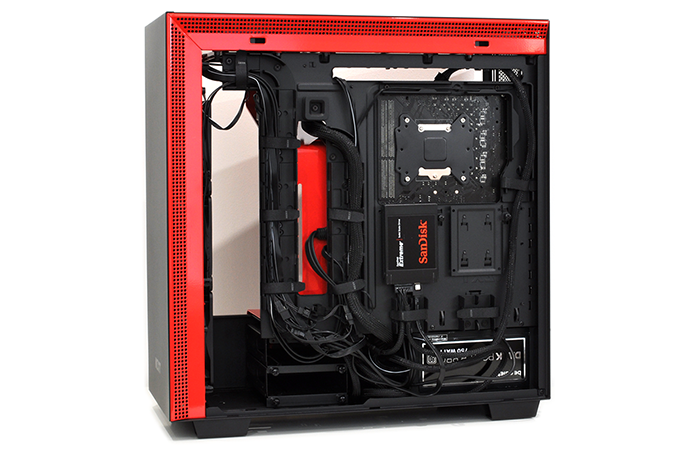 The first question we need to ask is what would we want from an H440 successor? The upgrades that spring to mind are a larger side window, better ventilation for the front fans and an updated selection of I/O ports. Relatively simple tweaks, and when you first remove the H700i from the box, it immediately gives the vibe of a modernised NZXT case. 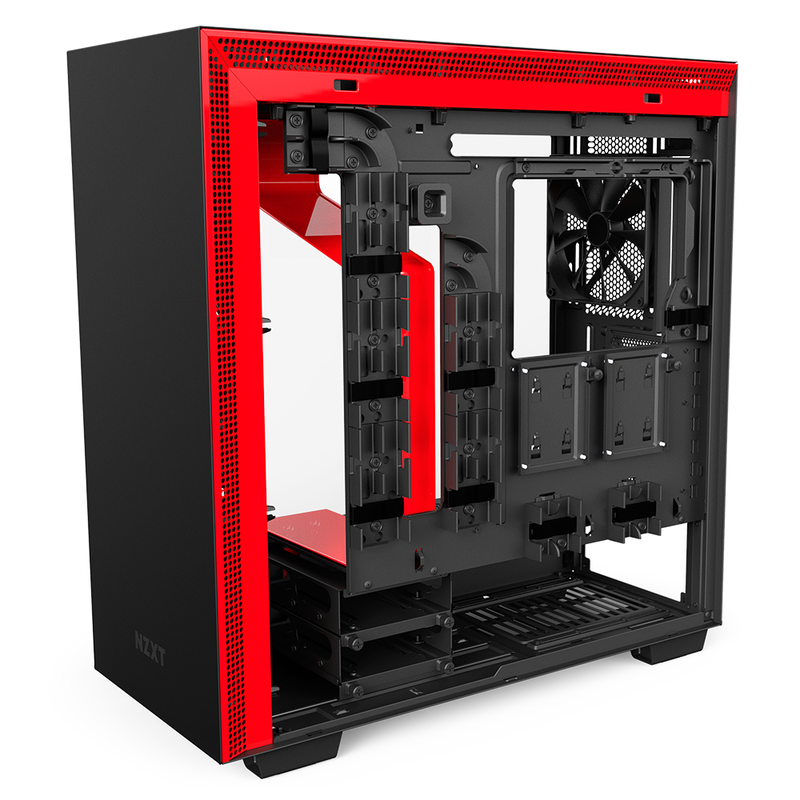 Signature two-tone colouring is both striking and playful, giving the H700i the look and feel of a H440 born in 2017, and don't worry, an all-black option is available if a splash of red, white or blue isn't your thing. 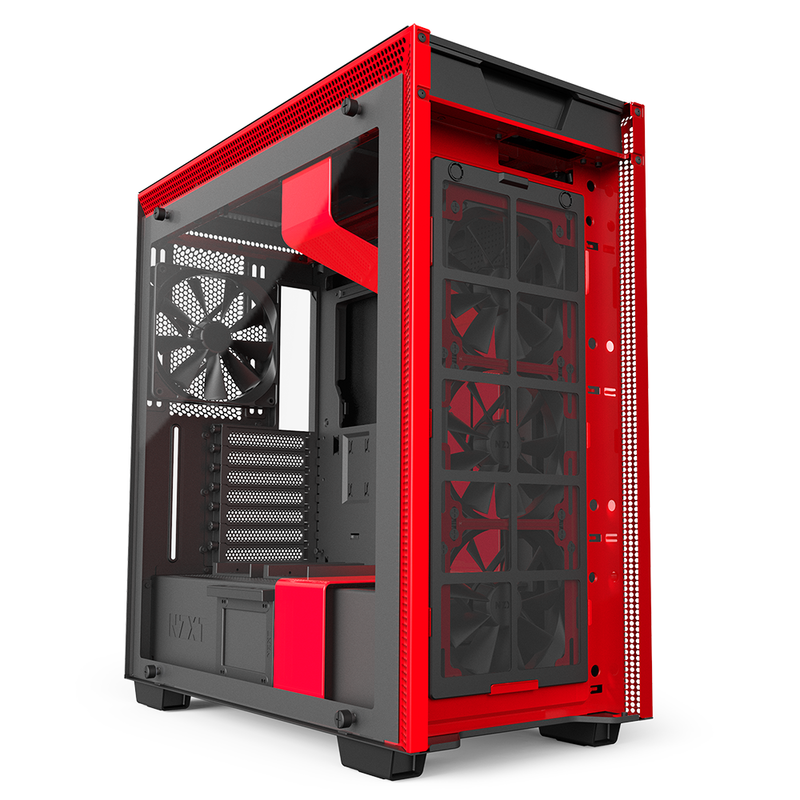 Build quality has moved forward, with NZXT taking a more upmarket approach by ensuring an all-steel construction. The choice of material gives the enclosure good rigidity, and the perforations in the angled metal sections lining the front and top sides is neatly done and bodes well for airflow. Of course, given that tempered glass is all the rage, it's no surprise to see that NZXT has implemented a full-size glass panel that is held in place via four thumb screws. The glass provides an elegant finish, though it's a shame it isn't secured on a hinge - as it is, the panel risks falling out when unfastened, so do be careful when entering and exiting the case. 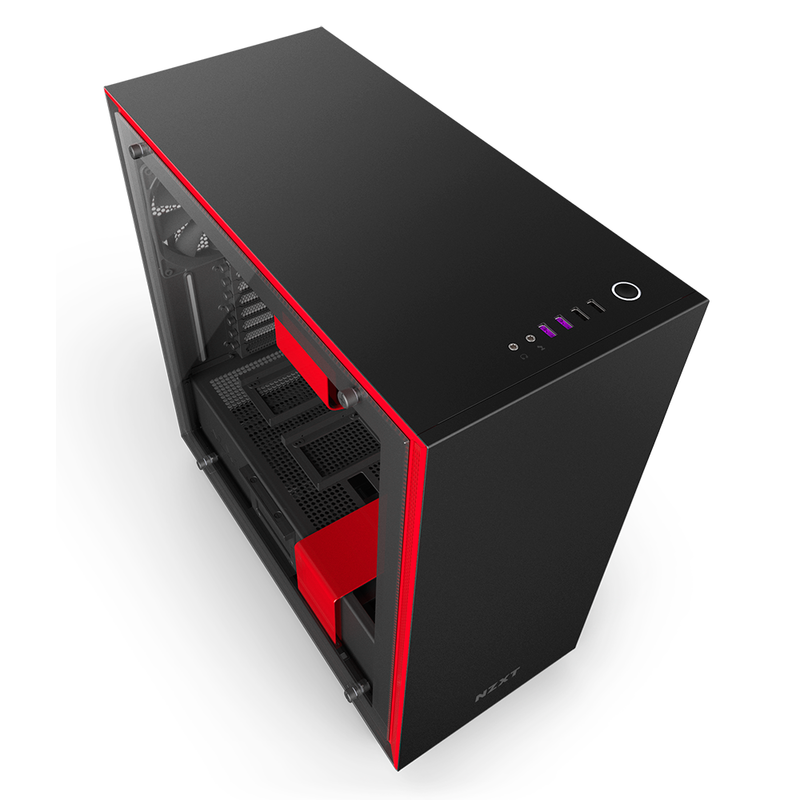 We're liking what NZXT has done in terms of exterior design - the H700i has a clean, modern-looking aesthetic - however it needs to offer more than just a visual refresh to justify a price tag that is more than double the H440. Given the premium, it's a shame the top I/O panel hasn't been updated. We had assumed that USB Type-C would be a foregone conclusion, but NZXT has kept to four Type-A ports (two of the 2.0 variety, plus a faster pair supporting 3.1 Gen 1) as well as headset/microphone jacks. The absence of Type-C could be a deal breaker for some, and confounding matters, there's also no reset button alongside the backlit power switch. If you're planning on using ultra-high-end components, and plenty of them, you'll like the fact that the H700i is a tad larger than the H440, measuring 516mm (H) x 494mm (D) x 230mm (W). 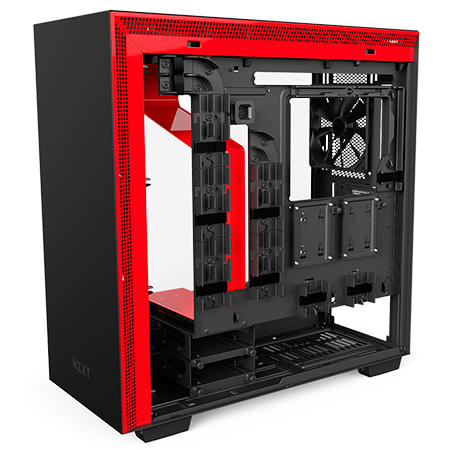 Albeit a bit bulky for a mid-tower solution, the extra wiggle room allows support for a mini, micro, standard or extended ATX motherboard, and NZXT makes the sensible decision not to have tempered glass on both sides. 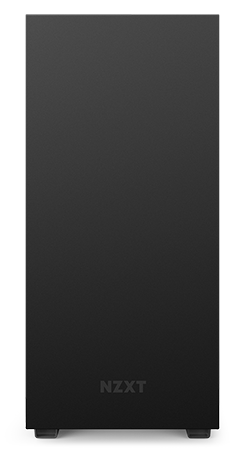 The rear side panel is solid and comes away quickly by pressing a push-to-release button on the back. The mechanism works so well, in fact, that removing the front tempered glass panel feels a chore in comparison. On the inside, a few simple changes have paved the way for a more elaborately-cooled setup. 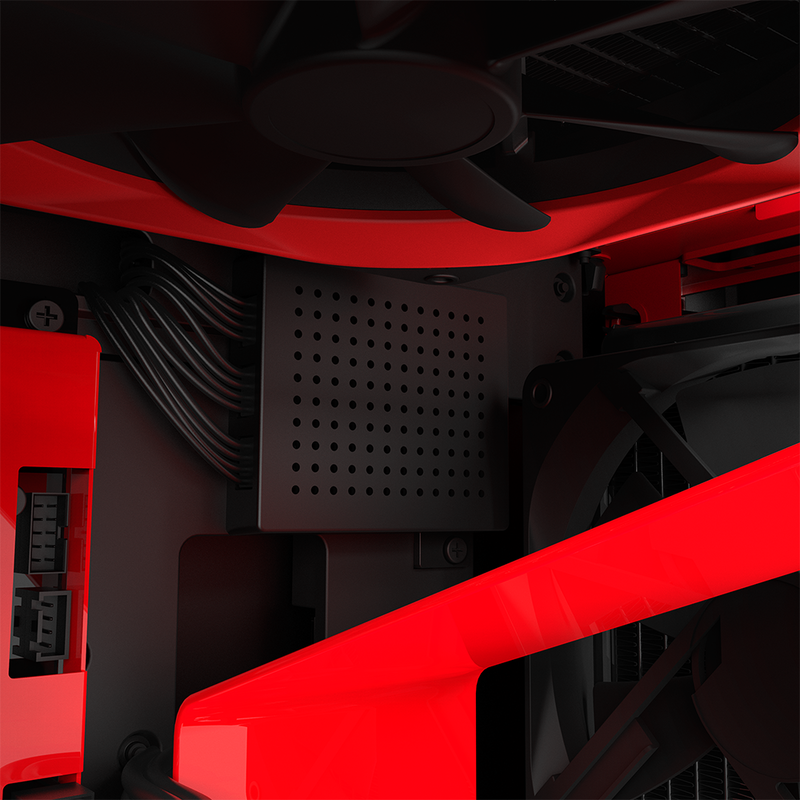 The H440's storage column has bitten the dust, leaving room for all your liquid-cooling paraphernalia, and there's no shortage of fan mounts. In addition to the rear 120/140, there is provision for three 120s or two 140s in the front and up top, meaning 280 or 360 radiators should slot in with ease. NZXT quotes a thickness clearance of 30mm for a top rad, or 60mm if installed up front, while a CPU heatsink can measure up to 185mm tall. 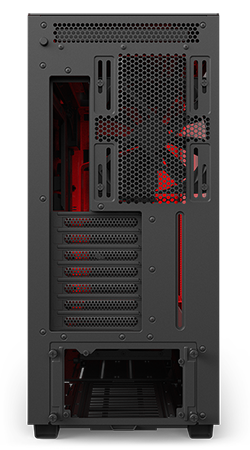 Four fans are included as standard - a 140mm rear exhaust and three 120mm front intakes - and there's good filtering throughout, with NZXT installing a full-size mesh cover in the front and a smaller pull-out filter beneath the PSU. 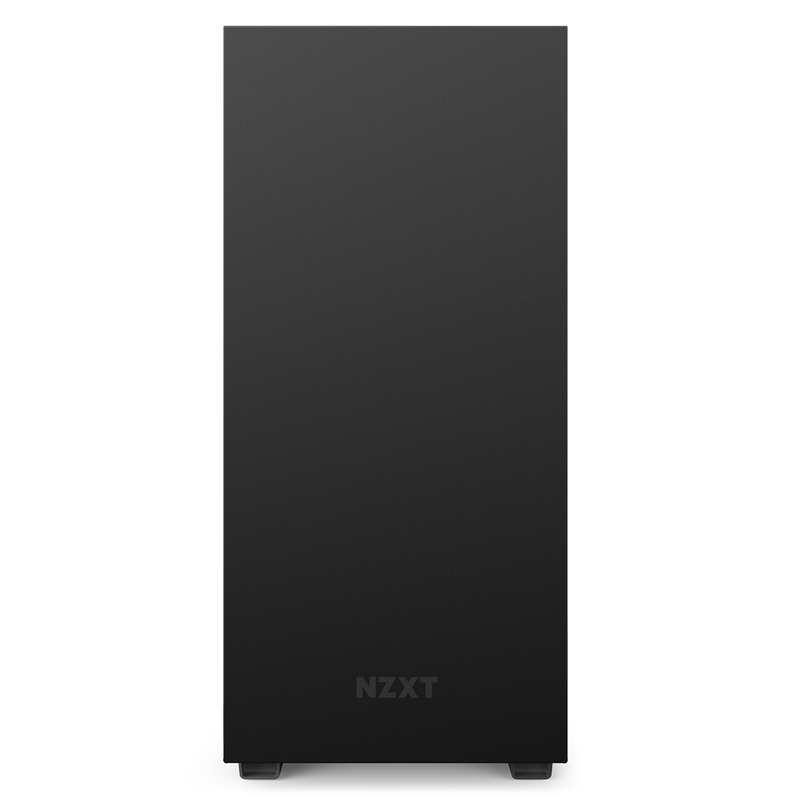 Given that the traditional storage column has fallen by the wayside, it's good to see that NZXT has still managed to find room for up to seven drives. Two 2.3/3.5in drive trays are available in a removable cage near the end of the PSU compartment, and five 2.5in sleds are scattered around the rest of the enclosure; one on the side of the PSU shroud; two on the top; and a further two behind the motherboard tray. The final build can appear mighty impressive, and we're looking forward to seeing what enthusiasts and modders will create with the various colour schemes, but there are elements of the H700i that don't tickle our fancy. Behind the motherboard tray, for example, are dedicated cable-routing channels that act as a road network for all your wiring. These plastic guides are plentiful, but channelling all your cables and tying them down with the Velcro tabs proves laborious, and in our estimation the end result isn't any better than the traditional solution of rubber-grommeted holes and a couple of tie-down points. According to NZXT, some of the major challenges facing PC builders today are "complexity" and "tedious and time-consuming tasks." The H700i attempts to overcome some hurdles, but in guiding the user down a preferred path, it takes away some of the joy and discovery of a self-build. The best example of that is the inclusion of a Smart Device that's neatly hidden inside the case and tasked with managing your fans and RGB lighting. You can, of course, continue to use your motherboard's available headers, but NZXT would prefer you to side with the Smart Device and the accompanying CAM software. 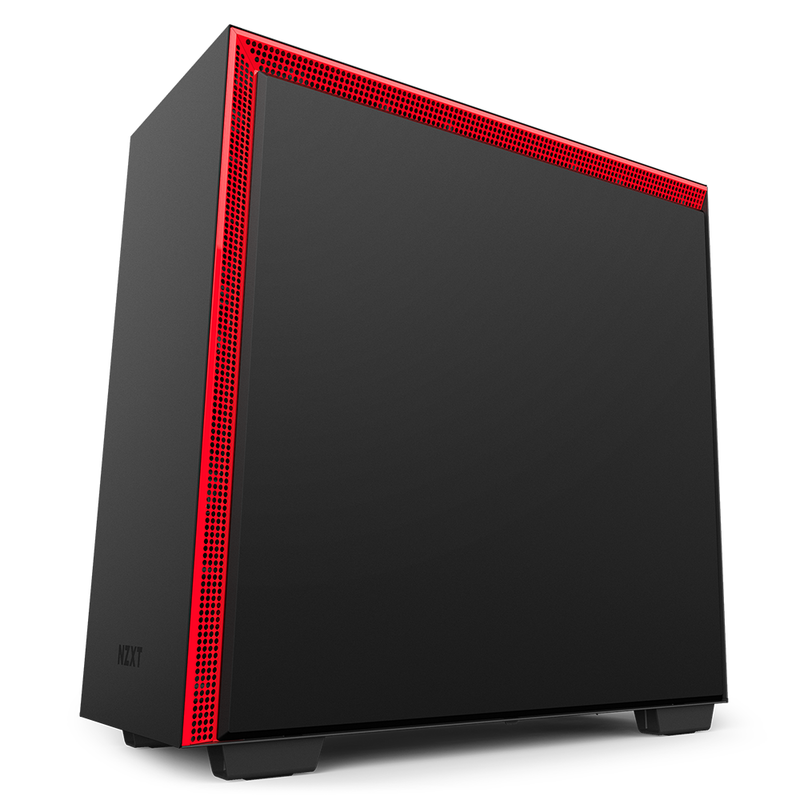 Unfortunately, said software is arguably the H700i's weakest link.